This wasn’t quite the match that anyone expected. But maybe it should have been. As the countdown to the World Cup approaches nine weeks and it becomes more apparent the United States will head to France with a tenuous defense, Thursday night in Colorado was a chance to go up against another side that can score in the blink of an eye — but sometimes forgets to defend. The Americans’ 5-3 win over Australia showed what both teams can do in their most dangerous moments, but also exemplified each teams’ penchants for sloppy turnovers and foibles on the back lines. Along the eight-goal journey was Alex Morgan’s 100th goal in a U.S. kit, Sam Kerr’s first goal against the U.S., and a pair from Mallory Pugh in front of her hometown fans. U.S. coach Jill Ellis is without Kelley O’Hara for this series, which concludes Sunday night in Los Angeles against Belgium. 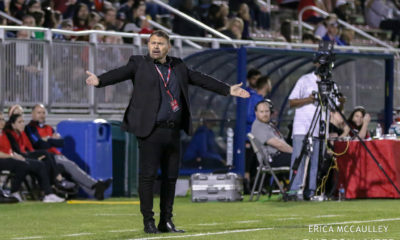 O’Hara’s absence compelled Ellis to call on 2015 World Cup starter Ali Krieger, but the veteran of 98 caps remained an enthusiastic cheerleader through at least three different variations at the back for the Americans. 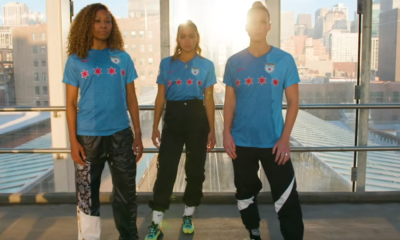 The first one was, from right-to-left, Emily Sonnett, Abby Dahlkemper, Becky Sauerbrunn and Crystal Dunn. Sonnett appears to have an inside track at starting if O’Hara is unable to answer the bell. But Sonnett is not a right back by trade and it shows in her hesitancy to go forward. 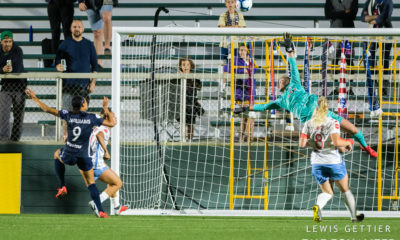 She did manage to get there at times and was even in on Pugh’s first goal, but Sonnett does not naturally advance into space for her teammates to find her and push the attack. Most of the attacking action on the U.S.’ right side on Thursday went through Tobin Heath and, at times Rose Lavelle, during the first half. Yet Sonnett’s instinct to stay home did not help on Australia’s opener. The sequence was a counterattack and if you just tuned in and watched the play without knowing the personnel you could have been forgiven for thinking Sonnett was a center back sprinting over for some emergency defending as Lisa De Vanna literally had the run of the Australian left side to herself. Sonnett was doing emergency defending, but it was an emergency of her own creation as she backtracked centrally, which gave De Vanna the space. The defender arrived too late to make a difference. Late in the second half, Ellis called on Tierna Davidson to replace Sonnett. 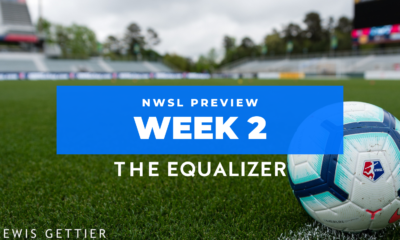 Davidson once looked like the frontrunner to start centrally next to Sauerbrunn, but an injury last fall looks to have put Dahlkemper in the driver’s seat. When Davidson came in, she went to left back and Crystal Dunn (who had a much better night than when last we saw her at the SheBelieves Cup) switched to the right side. That setup did not last long as Ellis eventually made some other moves and finished off the pesky Matildas with a five-back. One of those five was Allie Long. No, it wasn’t a return to the nightmare, 3-5-2 experiment that had Long in the middle, but it was interesting personnel for the setup, nonetheless. So it seems that four years after smothering their opposition to death with five straight shutouts at the World Cup, and three years after being bunkered to death themselves, the U.S. will be trying to repeat by outscoring everyone. That’s why Sam Mewis coming off the bench makes so little sense. 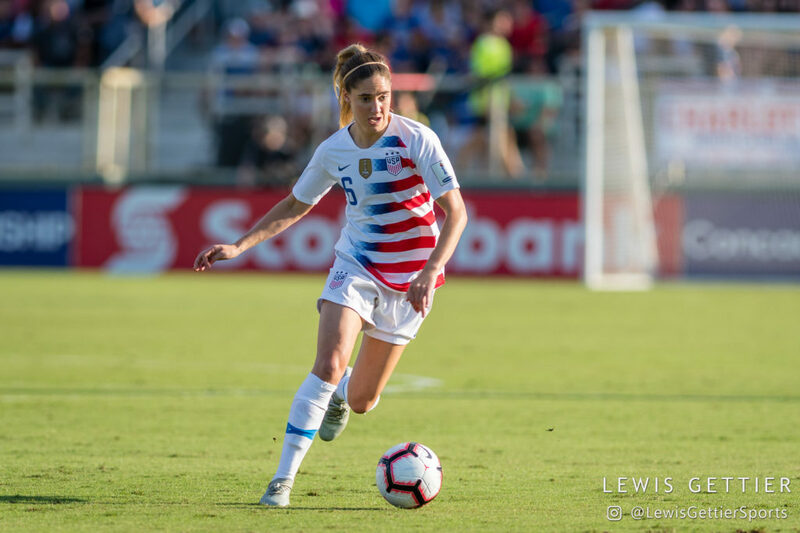 Against Australia, Mewis replaced Lavelle at halftime and it took less than eight minutes to see the worst, and then the best, she has to offer. When Australia took their only lead of the night through a dynamic run by Caitlin Foord, Mewis was one of the key midfielders Foord went through. Yes, Mewis slipped on the play, but she slipped in large part because she was beat and attempting to turn. But later, it was Mewis who dug out a 50/50 ball and beat multiple Australians to build an attack that ultimately ended with the equalizer. For a team that wants to push the tempo, Mewis should be in the starting lineup, and she is also plenty capable of winning defensive balls with her head. It was also a difficult night to judge the midfield because Lindsey Horan played like someone a half step behind—not unwarranted after she missed SheBelieves with an injury. If there was a defensive strength on the night for the United States, it came from the front line. 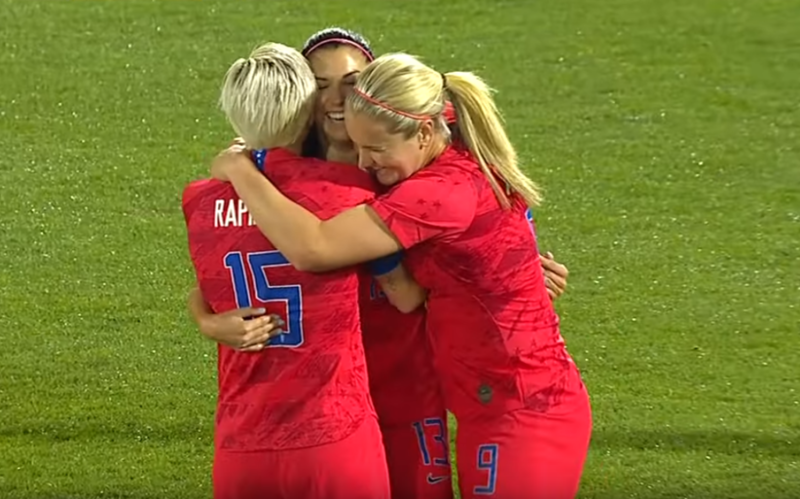 Ellis conceded that pressing for 90 minutes at altitude is not feasible, but through the opening 45, the front three of Tobin Heath, Alex Morgan and Megan Rapinoe kept the pressure on the Australian backline and made buildup play virtually non-existent. At the end of one U.S. attack, the ball bounced toward Aussie keeper Lydia Williams, but Alanna Kennedy waived her off and took the ball at her feet. She turned, and then had nowhere to go and Australia remained pinned back for the next minute or more. If the U.S. are going to press at the World Cup — meaning against the good teams — they are going to need to get their lines in lockstep. Conceding the types of goals like De Vanna’s counter are moments that crush World Cup dreams. On this night, the U.S. came up against a side with its own defensive issues, not to mention still being in the throws of adjusting to new coach Ante Milicic. The result was a 5-3 win for the Americans. Whether or not that style can prevail in France remains an open question.